The city will allow building heights from 55 to 200 feet, which is about 16 stories tall. City officials want to encourage developers to build up rather than the construction of more strip malls. You can read all about this rezone in item 8B in the agenda packet available here, especially Exhibit A, starting on page 406. The revised zoning code starts around page 500. It envisions three new Midway zoning designations: MCT-1, with 80% lot coverage and 5 story/55 ft heights; MCT-2, with 100% max site coverage, and 16 story/200 ft heights; and MCR, with 80% coverage and 200 ft heights. Height limits are shorter at the edges. Multifamily parking requirements dropped from a status quo of 1.8-2 spaces per unit (1 per unit for efficiencies) to 0.75 in these zones; the current RV parking requirement would be waived entirely. It’s a common argument that it doesn’t make much sense to build high-capacity transit way out into the suburbs when so many close-in neighborhoods remain underserved. While this has a a lot of merit, suburbs that are willing to think this big can create actual destination stations that make all-day service worthwhile, especially when Seattle is fighting trench warfare over the difference between 40 and 65 feet. Enough about zones; much more about station location and old-school stakeholder feedback after the jump. The SR-99 Station option generally represented one that Sound Transit considered for budgeting purposes. Their rail alignment was located along the west side of SR-99 as an elevated structure near Highline Community College. The vision expanded Highline Community College campus into the east parking lot with a pedestrian bridge to provide safe access across SR-99. New roads break up the existing street grid and a regional detention facility manages stormwater runoff. Bridges over SR-516 and I-5 would connect neighborhoods. The 30th Ave South Station option came out of the public process. The alignment would be at grade through the station area, becoming elevated south of S 240th St. The roads, detention facility, and campus expansion found in the SR-99 concept are also proposed here. Both the public and the Stakeholders Committee thought a 30th Ave alignment could create a more pedestrian friendly environment, where the train and automobiles moved at a slower pace than would be the case along SR-99. A large amount of right of way would be needed to accommodate multiple modes of transportation on 30th Ave. The I-5 Station option was considered because the Cities of Des Moines and Federal Way Comprehensive Plans express the desire for locating future light rail on I-5 and not on SR-99. The trains would move along a combination of elevated and at-grade rail alignments. The roads, detention facility, and campus expansion found in the SR-99 concept are also proposed here. There would be an uphill climb to SR-99 and the college, and limited opportunity for development to the east of the station. After completing the Envision Midway public outreach and compiling the feedback, a fourth station option was developed. This fourth option reflects the additional comments from representatives of Highline Community College who wish to preserve their east parking lot, thereby negating transit oriented development within their boundaries. The fourth option places the light rail station on the east side of SR-99,connecting the station directly to an area poised for transit supportive development… [See below] . The vision includes parks, a multi-purpose trail adjacent to an enhanced regional stormwater detention facility. Public and private circulation is pedestrian-friendly and connects to the trails and parks. I’m baffled by Highlines objection to density upgrades for the parking lot between the campus and Hwy99. It doesn’t say they have to sell the lot to a developer. Actually, they could do some EOD/TOD on the site. Education oriented Dev./… How about a 20 story new campus bldg, with housing on the top floors, classrooms on the lower floors and a new Admin/Library/Cafateria on the bottom. I used to go there and think this is an opportunity, not a distraction to the mission – although I do miss the flea market at the drive-in. It does sound like Kent has gotten a clue on density, while Des Moines is still stuck in the 1950s. I’m proud of my suburb today. That looks like a nice design. I would love if downtown businesses that force a lot of commuters into the city could relocate further south to this location. The problem I foresee is that so much of our transit (and roadways) are North South oriented, whereas a cluster of business in this location would draw people especially from the East — Kent Valley, East Hill and so on. That would especially tax roadways — which, in my opinion are inadequate when it comes to East-West transportation in the region. And express bus travel is non-existant (though obviously that could be remedied). This North-South versus East-West is a consistent theme of mine, and I have used to express problems with the bicycle infrastructure as well. Obviously part of it is the historical topography — it’s easier to go in a line at one level of elevation, rather than go down a hill, into a valley and back up again. But we have this newfangled technology called “motors”. And Seattle is showing with it’s 1st Hill Street car that steep grades can be managed with rail transit. Is it me, or are those setbacks awful? A pedestrian area needs storefronts, not bushes. Kudos to Kent for considering such a large upzone. This is the kind of thing that could exist all along 99. So would it have happened if it weren’t for Link? It didn’t happen with RapidRide A, so we know that. Whether it would have happened with Swift we don’t know, but I’d say Link is a large part of why this neighborhood is being considered. It will reorient Kent east-west. That’s a good thing, although it does raise some challenges. It’s 3 1/2 miles from 99 to 104th (the current higher-density parts of Kent), or 5 miles from 99 to 132nd (a potential growth area), or further from 99 to Covington (the Bailo ideal). It’s too far to walk between the major nodes (99, Kent Station, East Hill). All of these imply a frequent/fast bus between these areas. It plus Link will probably never be able to match the 150 for Kent-Seattle trips, but it could be the “more frequent but slower” option, which would be better than the “slow and infrequent” choices available now. Another challenge is going over the ridge. To me, KDM Road is the most obvious/fastest choice, but I don’t know if it bogs down in rush hour. The 166 currently goes on Reith Road and Military Road, which seems like a significant detour but it could allow some density on those roads if the city allows it. Another option would be 228th (with hopefully a transit bridge over I-5); I don’t know if that would be as good or worse than Reith Road. I think it’s all isolated office/industrial parks there, which would be better for commuter-oriented transit than all-day transit. But one way or another, there needs to be a good connection between Kent Station and Link. Transit fans may have fun thinking up a streetcar route and pushing the city council to adopt it. Reith Road/Military road really wouldn’t make sense. It’s too far out of the way, weaves around a lot, and just doesn’t have the capacity. If we’re thinking RapidRide style service, Reith Road is pretty steep. In icy weather, that’s bad. S 231st Way (should be called the S 228th Extension) would allow a bit of traffic to get across the valley, but not back up the East Hill. This path is also pretty steep. It’s not closed for regular ice, but it is for major snow events. K-D Road does get pretty busy both directions around rush-hours, especially at I-5 and SR-167. Even north-south transit serving Kent is far from ideal. It’s pretty good during the peak when the Sounder is running, but at all other times, the milk runs of the 150 and 180, plus the 566, is pretty much all you’ve got. On weekends when the 566 isn’t running, I don’t think it’s even possible to get from Kent to Renton without either a transfer. 150->140 is an awful connection between two infrequent milk runs and 150->F won’t be all that much better. 180->560 would be worse, and backtracking to downtown Seattle to take the 101 would be worse still. And Link won’t help this much – by the time you take a 20 minute bus ride to a Link stop along SR-99, then wait 5 minutes for the train, then ride it for 45 minutes to downtown Seattle, you’re looking at a 70 minute trip, about 20 minutes longer than the 150. With the 150 already running every 15-30 minutes most of the day, it would be nearly impossible for increased frequency to make up this much time. What Kent really needs north-south-wise is an ST express service down the 167 corridor that runs all day, seven days a week and doesn’t have all the stops and circuitousness of the 150. Auburn has this with the 578, only it skips Kent to serve Federal Way instead because that’s the only way to give Federal Way 30-minute headways to Seattle with the 594 skipping it. So, the conclusion is rather obvious – replace the 578’s stop in Federal Way with a stop in Kent. Then, maintain the existing level of service to Federal Way by combining the 577 and 594 into one route. 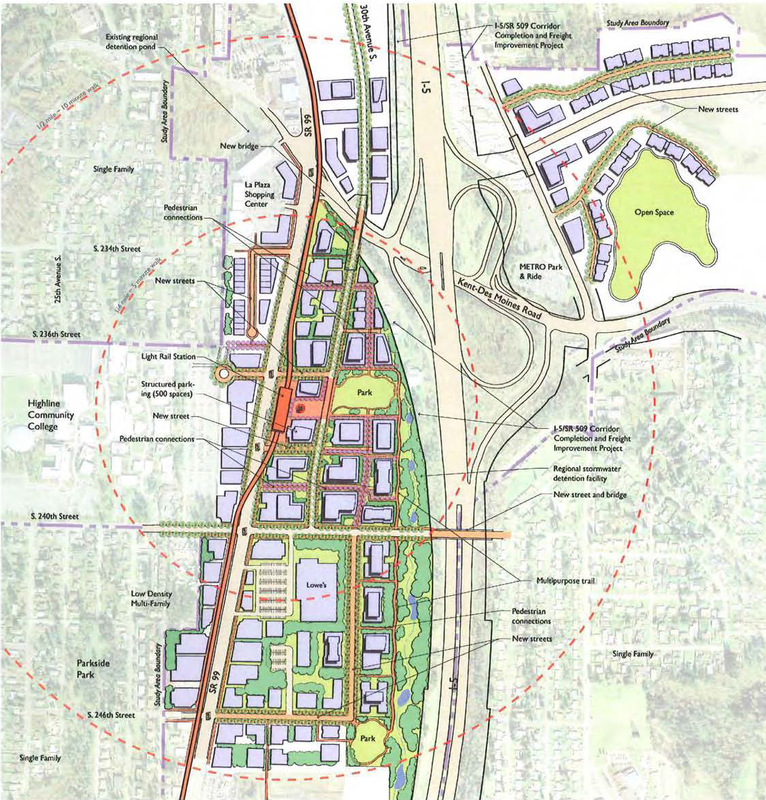 When this is done, the next step is to done some engineering work to see what it would take to build a freeway station along 405 in Renton that would enable the 578 to make a quick stop for Renton without getting bogged down in Renton’s awful surface-street traffic. When this is completed, we can truncate the 566 in Renton and truncate the 101 at Ranier Beach, reinvesting the service hours to boost frequency and span of the service that remains. After this, we will have a real transit corridor along 167, rather than a hodge-podge of buses. As a regular afternoon and late night/early morning 150 commuter, I don’t disagree. I don’t like the amount of time it takes to get through Tukwila (north of the mall). I’m fine with Kent to Southcenter, but it’d be nice if there were a few expresses that went from Southcenter straight to Seattle (same reverse). While it’s only commuter hours on weekdays, Kent-Renton also has route 153. The 169 runs full-time between Kent and Renton. It’s another potential RapidRide candidate. And you could extend it to Rainier Beach to replace the 101. Sending the 578 to Kent would make sense. That would help rectify the gross underservice in central south King County. Sending it to Renton too would solve the problem of a Kent-Renton express. But I don’t think you could just terminate it in Renton because that would be a weak route (no Puyallup-Seattle connection). So it would probably have to continue to Rainier Beach too. That would result in both a local (169) and an express (578) bus on MLK, by the way. I was envisioning the 578 making a very quick stop in Renton through a freeway station, the continuing on north, with the next stop being downtown Seattle (and I mean real downtown, NOT Sodo). Besides cutting the time between Kent and Renton in half, it would also mitigate the need to have the 101 go all the way downtown to make travel times acceptable to/from Renton, since anyone who’s willing to drive to the park-and-ride would still have a one seat ride that would actually be faster than the 101 today. So the we can truncate the 101 and 150 as well at Ranier Beach, with the savings reinvested to boost frequency. However, if we treat the freeway structure of 405 as fixed and assume it’s impossible for the 578 to make any stop in Renton without wasting 10+ minutes waiting for stoplights and traffic jams, then I think there is no reasonable choice except to have the 578 go non-stop to downtown from Kent and to rely on other routes, such as 101, 566, and 169, to access Renton. Not as efficient as it could be, but you have to work with the street network you have. It would still be a, huge improvement over today. The 169 runs frequently but along the backbone of Kent East Hill. It starts down at Kent Station and its very, very heavily used most times of day. It will take you all the way into downtown Renton, but as you note — it’s a local, makes all stops and doesn’t interchange with LINK. Kent East Hill-Kent-Southcenter — very, very big demand, especially by teens w/o licenses but also workers. Kent East Hill-Renton — as I mentioned, this route is heavily used because (I think) of the schools, the many malls that have employment and social services, the apartment complexes that line 104th/108th/Benson. The 578 is odd because it stops in Auburn but not in Kent. I’ve asked and asked and asked about express Kent Station to Seattle but never get a satisfactory answer. I think they are waiting on the day when we can get more Sounder runs (an even more ideal situation) — but those are expensive and dependent on BNSF granting the request. Where would this freeway station be, and what would you be able to walk to or transfer to? It’s not really “serving Renton” if it doesn’t go to the transit center or at least the P&R, or some other equally useful location. And if it doesn’t transfer to most of the other Renton routes, you’d have to take a bus from there to the TC and then transfer again. I’m more worried about the opposite; that it would get bogged down on 405. Not everyone who uses the P&R takes a car to it. I get off the bus there to go to Renton City Hall, and when I’m transferring from the 169 to the 101 I’ll often go into Uwajimaya or Applebee’s while I’m waiting. In any case, now you’re saying that the freeway station will be at the existing P&R? How? The P&R is not on either 405 or 167; it’s two blocks away on Grady Way. That reminds me, I think part of the agreement between ST and Kent, Auburn, and Puyallup was that if they got Sounder, they wouldn’t get much other ST services. So that may be part of it. I rode the 166 today to see what’s there. Military Road is fast, as fast as KDM Road I think. It’s all 1950s large-lot houses which may predate the freeway. Reith Road is a bit slower, with large-lot new houses and some city parks. The lots are so large and the houses so new it practically shouts NIMBY, and the slopes around Reith Road would make to-the-street developments difficult. The hills are too steep for a streetcar, and that’s probably true for any route. Joshua seems to say none of the options are good: Reith Road, 228th, or KDM Road. But the bus must go somewhere. KDM Road is the snow route, so that argues in its favor. I guess Metro will just have to forget about local ridership between I-5 and Meeker and put it on KDM Road. The 166 could remain to serve the parks and houses, and could be downgraded to hourly after the main route starts. Trust me when I say that I would love to have east-west service from the valley to the west hill. I’m just annoyed that there’s not a logical, GOOD route that can be easily developed into TOD. And no surface alignment! “a 30th Ave alignment could create a more pedestrian friendly environment, where the train and automobiles moved at a slower pace than would be the case along SR-99”. ST has already budgeted for elevated, and slowdowns would have implications for Federal Way and Tacoma. A 20 mph surface train does not help anybody; it’s not like there will be more stations in this area. An overhead train does not get into pedestrians’ way. And while people have suggested a surface station would work better at Bellevue TC, so that it’s a shorter walk to the platform, that doesn’t seem to apply to the south end. The distances are longer there so the need for speed is greater, and there’s no existing Bellevue Square and downtown to accommodate. So the area can be designed for maximum efficiency with an elevated train entrance. Exactly. There’s no excuse for surface. This line needs to be elevated all the way to Tacoma; the further south it extends, the more of a problem delays become. I still believe we’ll need a Duwamish bypass before it’s a viable commute alternative to ST Express buses. IRT BTC: Keep in mind that the line goes much further than that: to Overlake and eventually Redmond, so we’d have the same fallout from slowdowns there. This line needs to not make it to Tacoma. Regardless of whether it should go to Tacoma, we shouldn’t put built-in limitations and inefficiencies in it. That just limits our options, and would turn out horrible if Link does end up being extended to Tacoma. Link should make it to Tacoma because not all the ridership wanting to go to Tacoma is from downtown or points north thereof. Remember, if it is on the surface, it follows whatever the parallel roadway speed limit is. If the speed limit is on SR-99 45mph, Link can do 45mph. It’s a nice idea, but I don’t really see anyone financing high-rises in Kent. A lot can change in 10 years. This will actually be a great location for many companies once light rail goes through. Close to the airport. Access via LR or road to Seattle and the eastside. Multiple housing options for their employees. Brian, hardly anybody lives there. It’s mostly owned by slumlords and strip malls that are in decline. West Hill (Midway) makes up a very small % of the city’s population and I think most of that constituency is cool with it actually. The council would also be interested in boosting tax revenues and pushing economic development. It’s pretty much a win for everybody. Plus, Des Moines already has proposals for mid-rises just north of Midway. It’s bound to happen at some point. But I don’t think anyone seriously believes 200 ft building will be built there. Ooops. Thought you said “fancying”. Nevermind. RV parking requirement? Like for recreational vehicles? For real? I thought that was odd too. Man it’s a different world out in Kent. I have noticed a lot of motorcycles/scooters in the Kent area… maybe that is what they meant? Nope, RV parking. I live a few blocks away from the proposed station, and would estimate about 10-25% of my neighbors have RVs parked on their property or on the street. parking for RVs, Boats, and various types of trailers is generally in demand. Most of my time in the suburbs, I had a flatbed trailer parked on the land just because I had room for it, and I needed to move broken down / unlicensed vehicles every once in a while. Sure. But codes requiring you to install RV parking? And transit advocates are the social engineers? This is not a standard rezone. It is a 4-year subarea plan process with the City of Des Moines. The distinction is important. The SEPA review took a very long time. Thankfully, this is over. Also, I still have that charette map of option 4 pinned on my cubicle wall after all these years. Kudos to the hard working staff! I don’t mind subsidizing Park & Rides to an extent but at some point you need to start transferring at least part of the costs to those of us who live in less dense areas. Speaking selfishly, I’d prefer knowing that I can pay $3-$5 for a parking spot if I know I’m always going to have a parking stall available when I need it. (Then again, I live close enough that I’ll likely bike to the P&R and leave that stall for somebody else). Metro and Sound Transit: PLEASE start charging for parking at P&R lots that are at capacity. Even charging $2 a day might be enough to make people make changes. I know I would stop parking at Kent Station and start going to the Lincoln St P&R or parking closer to Covington. Others would still be inclined to pay. But I agree with what you say even though I’d be unduly affected by it. You just have to look at the TIBS parking lot to see why you’re right. Something I just noticed on Saturday at TIBS – airport workers parking there and taking the light rail to SEA. That plus people parking there for baseball/football/soccer games = full lots. So Kent can go for 200, but Roosevelt can’t handle 65? Is that really going to destroy the community? I’m not voting for Nick Licata again. Apples and oranges. (1) Roosevelt is a historic neighborhood with a center and a community that has volunteered over the years to keep it in good condition (except Sisley). Midway is 1950s strip malls that have been left to decay. (In my mind, that shows their intrinsic value: they look throwaway and drive-in, and people treat them that way.) I haven’t seen the houses on 30th but I assume they’re run down and there’s little sense of community because there’s no center. (2) Midway’s relationship to Kent is different from Roosevelt’s relationship to Seattle. It’s Kent’s third biggest commercial area I think, while Roosevelt is one of Seattle’s most successful residential neighborhood with some pedestrian retail and a high school. (3) Seattle is much bigger than Kent and has other areas that are more like Midway, but Roosevelt isn’t one of them. North Rainier comes to mind, and also Aurora of course. AS long as Link south of SeaTac is elevated for its entire duration, I don’t really care what they do. The I-5 Station option was considered because the Cities of Des Moines and Federal Way Comprehensive Plans express the desire for locating future light rail on I-5 and not on SR-99. This really sums up those cities attitudes towards transit.